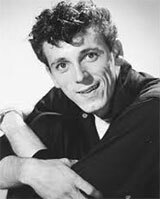 Gene Vincent, born Vincent Eugene Craddock, entered the local music scene in the mid-1950s in the genre then known as rockabilly – a style recently popularized by Elvis Presley – not quite hillbilly and not quite rock ‘n’ roll, but incorporating elements of each. A Naval career begun in 1952 was cut short three years later when a serious motorcycle accident nearly cost him his left leg. He would wear a leg brace for the rest of his life. Recuperating at Portsmouth Naval Hospital, Vincent amused himself by playing the guitar, allegedly buying a song called “Be-Bop-A-Lula” from a fellow patient. In 1955, his leg still in a cast, Vincent performed his rendition of the song before an audience at Country Show Time, a local revue sponsored by country music radio station WCMS. The performance was such a hit that WCMS recorded a demo of the song to enter in a contest sponsored by the managers of Capitol Records, who were hoping to find and sign the next Elvis Presley. The star’s backup band was dubbed The Blue Caps after the caps the group wore on stage. Gene Vincent and His Blue Caps signed with Capitol in April 1956. “Be-Bop-A-Lula,” which set a new sales record for Capitol, was Gene Vincent’s biggest hit. "Lotta Lovin'," produced in 1957, was his second and last recording to hit the Top Twenty. He and the Blue Caps parted company in 1958. Gene Vincent found his niche performing before live audiences. He appeared on American Bandstand and The Ed Sullivan Show, toured in Australia, South Africa and Japan, worked with Little Richard and Eddie Cochran and once opened for the Beatles. He achieved a nearly cult following in Europe, particularly in England and France. The stress of life on the road and the massive doses of painkillers taken since his 1955 accident finally undermined his health. He died from a ruptured ulcer in 1971, just 36 years old. Gene Vincent was inducted into the Rock and Roll Hall of Fame in 1998.